BRE Group: Building-Integrated Solar Technology - it's coming! You are here: Home » News & Information » BRE experts share their knowledge to help you » Building-Integrated Solar Technology - it's coming! Steve Pester of the BRE National Solar Centre (NSC). Set up to provide reliable, research-based information to the solar power industry, the NSC’s remit includes helping to develop the Building Integrated Photovoltaics (BIPV) market. This fledgling sector involves blending pleasing architectural design with the integration of solar technology directly into the building fabric. At present the market for BIPV is quite limited. On domestic buildings BIPV tends to be restricted to a few roof tile products that are sometimes used on new build developments. There is a market at the opposite end of the scale, with special (and expensive) facades or overhead glazing being used on large public or commercial buildings. But at the NSC we passionately believe that in the future BIPV will be a widespread and ordinary part of the building process – it is just a question of how quickly we can make it happen. 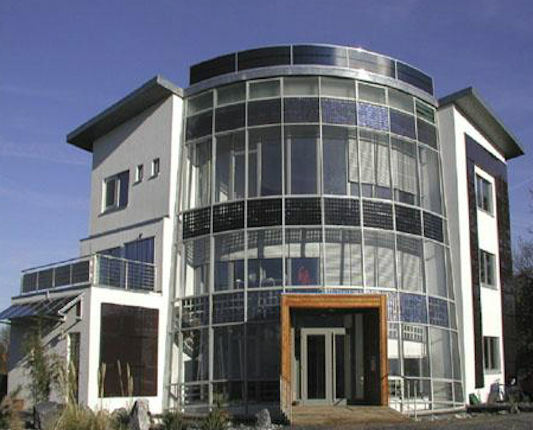 The photograph above shows an example of a modest commercial building with attractive BIPV features. At the larger scale - e.g. office tower facades - installing BIPV requires a high level of skill and knowledge from the supply chain, in which many parties are involved. These typically include the client, architect, consultant, building engineer, BIPV manufacturer, BIPV installer, glazing contractor and electrical engineer. At the domestic scale, however, PV tile products are relatively simple to install on new build properties and can often be carried out by an MCS approved electrical contractor and roofer team with minimal extra training. Some truly inspirational designs are now starting to pop up across the country. For example, an amazing PV louver array is taking shape on the top of the Frances Crick Institute, next to St Pancras Station in London. This unusual design balances the requirements for daylight and solar gain control within the building, whilst at the same time generating electricity. Just next door to St Pancras is Kings Cross Station, which has PV integrated into overhead glazing high up in one of the barrel-shaped halls. Staying with the rail station theme, Black Friars Bridge has one of the largest PV station arrays in Europe, generating power for the station all year round. Also in London, the Heron Tower in the City has one of the largest glass PV facades in Europe and is a must-see for anyone with an interest in BIPV. BIPV installations, whilst eligible for Feed-in tariffs (FITs), tend to be driven more by green building codes, such as BREEAM, as well as by planning requirements, and increasingly by the ever-tightening building regulations. This trend is set to continue. The recent huge falls in the cost of installing ordinary PV panels (approximately 50% over 3 years) is largely due to the reductions in the cost of the main raw material – solar grade silicon. This same raw material can also be used as the building block for BIPV products, so there is now much more potential for economical BIPV solutions at all scales. BIPV products are likely to benefit local economies. This is because, as part of the building fabric, they must conform to local standards and building codes. They also need to be amenable to local construction practices. Therefore, the logical way for the sector to develop is by local companies importing low cost silicon cells and then integrating them into building products suitable for the local market. As the BIPV market starts to develop, and with the standard ‘bolt-on’ solar panel market becoming so competitive, installers with BIPV capabilities may soon start to have an advantage over their less capable competitors. More retrofit BIPV solutions are starting to emerge, especially for situations where standard glazing or façades or roof coverings need to be replaced, so the market is potentially larger than just new build. BIPV products must be architecturally interesting and adaptable for bespoke designs – e.g. different colours, textures, shapes and sizes must be available. There must be good evidence of the robustness and longevity of BIPV products. Architects are unlikely to want to risk their reputations on products that cannot demonstrate a reasonable performance and lifecycle without physical or electrical degradation. Information on BIPV products must be integrated into the everyday tools that architects use. Increasingly, this means integration into specification and Building Information Modelling systems (BIM). At present, cost is still perceived to be an issue. This is partly an education problem brought about by the now-familiar FIT scheme. Many are still just looking at the price tag and FIT return-on-investment, without appreciating the value of BIPV as a building material offering multi-functionality and aesthetic design options. For example, interesting BIPV designs can also function as rain screens, solar shades, windows, sound insulating screens, visual displays, etc. Thus the cost can be partly offset or absorbed when the BIPV forms a component that would have been required in any case. Whilst the cost of BIPV will always be higher than that of standard framed modules, we can expect rapid price reductions as the market starts to take off and if raw material costs continue to fall. Innovations in thin film PV materials, which have the potential to be much cheaper than silicon-based products, but suffered set-backs during the recession, will eventually pay off, leading to the integration of low cost PV into a wide range of construction materials.